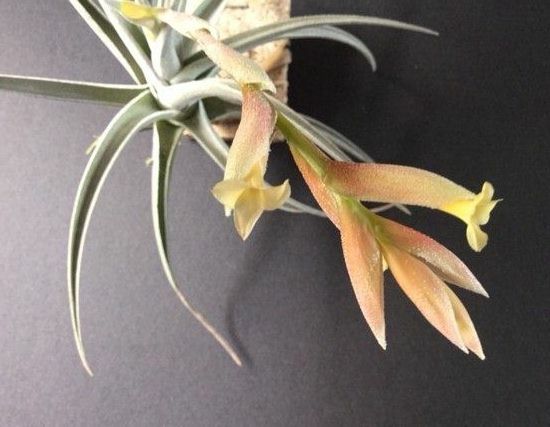 hybrid of ixioides? x ?, Rolly Reilly. 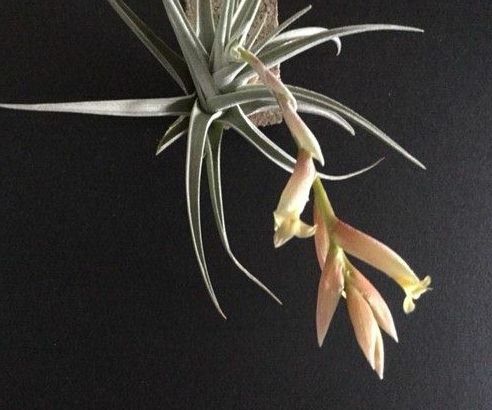 Ron Jell ... "This is my first flowering of the Tillandsia that I bought as 'Lemon Drop' and as I thought it was quite attractive I decided to share it. However, when I checked the BCR I could not find it. I am sure that I have previously heard of this plant mentioned at BSQ meetings and I think that it may be in a number of collections. 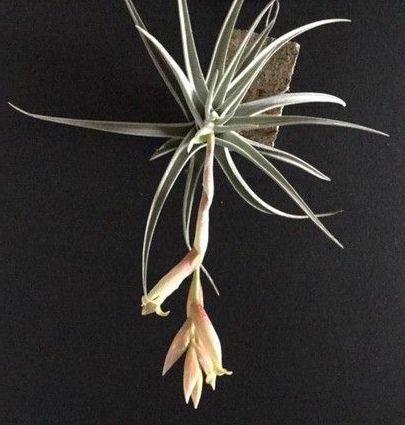 I do not know if this plant has been discussed here previously and maybe I am just covering old ground but, if not, do you think it should be registered?" Derek Butcher ... "Have a look at 'Poor Ixy' and the story behind it. Note that the photo shows how it grows in Adelaide!" Neville Ryan ... "T. Lemon Drop is a seedling that came from Rolly Reilly. It was in a collection that I purchased from Rolly about 20 years ago. I would say it has T. ixioides as part of the cross other then that I do not know. The original seedling took a long time to flower and it doesn't make a lot of offsets, when it did flower I called it 'Lemon Drop'." Geoff Lawn, for BCR ... "Mature rosette to 15cm. diameter. Stiff, channeled, scurfed silvery grey curved leaves. 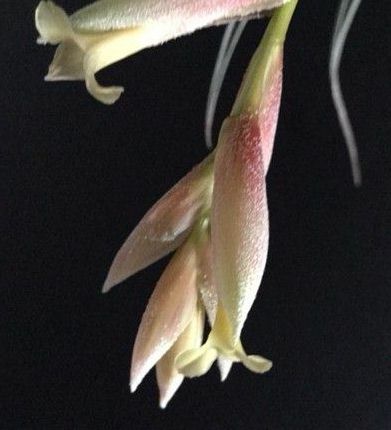 Drooping short spike of cream/ pink bracts and lemon flowers. Acquired as a seedling by the registrant from Rolly Reilly about 20 years ago. Reg. Doc. 1/2017 by Neville Ryan. Country of origin: Queensland Australia circa 1995"